In the period following the 19th Party Congress in October, President Xi Jinping’s aim for the nation has been clearly communicated: Only the Chinese Communist Party can save socialism---that is, the socialist path as contained in the new doctrine of Xi Jinping Thought. A major challenge for local officials is interpreting just what Xi’s goal means for them in their daily work. Nanjing’s government got a sense of the uncertainty of its role when Xi visited Jiangsu last week, ostensibly to commemorate the 80th anniversary of the massacre here. The trip seemed to be about that particular event. But instead of going directly to Nanjing, Xi stopped in the northern Jiangsu city of Xuzhou—on the way in and, surprisingly, returned there on his way back to Beijing, spending little time in Jiangsu’s capitol and emphasizing themes that might have seemed, to at least some Nanjing officials, to be more about the past than the present. After attending the gathering at the Nanjing Massacre Museum the next morning, Xi then returned to Xuzhou that afternoon. 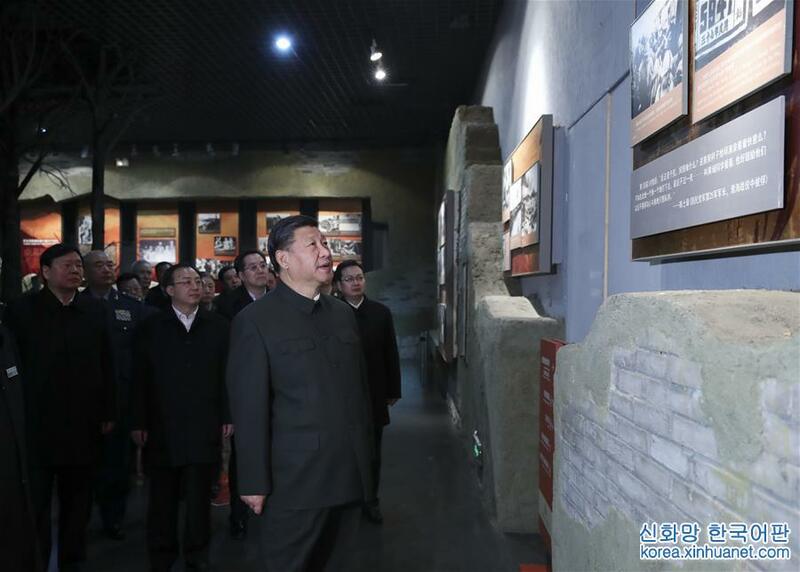 That was Xi again stressing the spiritual component of his political strategy to rejuvenate China, and how revisiting the revolutionary past should shape the bedrock of reform. There’s no doubt that Xi’s devotion is deeply genuine. And his very presence at these places is in stark contrast to the previous practices of some leaders and local officials. There is much to admire and praise here. At the same time, SOEs, the peasantry, “people’s war”, those are admonitions---authentic and inspirational to many, but they could be seen by some cadres as throwbacks, unconnected to such matters as urban management and assisting entrepreneurs. 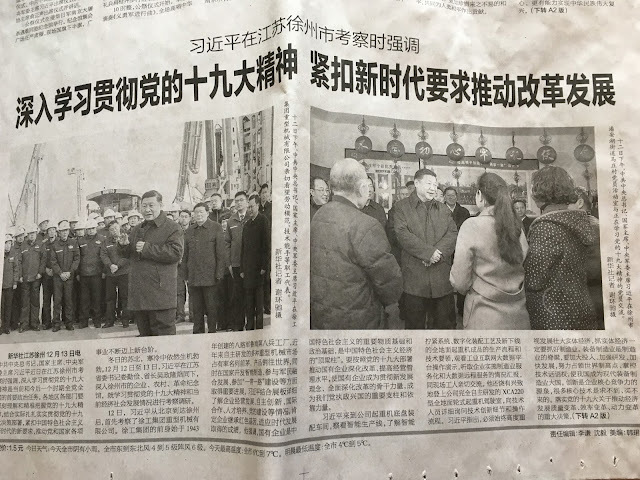 For Xi, the trip to Jiangsu was a commemoration more than an inspection---a reminder to local Party officials of their political mission [政治任务] and of his expectation of more progress in the provinces in the wake of the 19th Party Congress. But for officials in Nanjing, trying to put Xi’s strategy into practice may prove to be tricky. 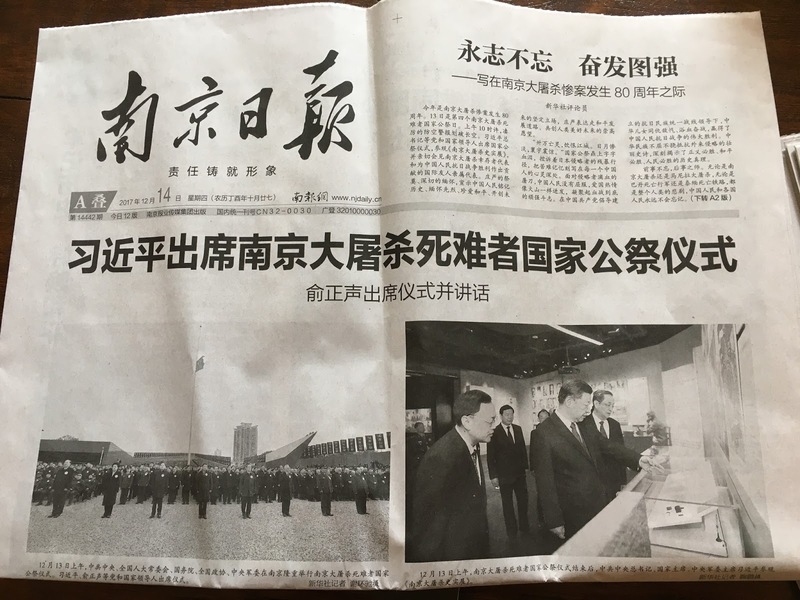 Just the day before Xi swung through Nanjing, Nanjing Ribao [南京日报] listed three tasks for the coming year--preventing major risks in the city's financial sector; enhancing pollution control; and poverty alleviation. So at least some cadres here seem to be signalling that the challenges they face are very much of this moment, and not a previous one. More on the latter aspect in the next posting. An objective that’s rather different from what Mao Zedong was urging (“only socialism can save China” [只有社会主义才能救中国] or “only the Communist Party can save China” [只有中国共产党才能救中国])--and what Chinese intellectual Qin Hui has sort to subvert through some of his commentary. Central new agencies in their coverage indicated it was both.